Cooking for one? Play with the salad bar. It is fun to reduce the servings in a given recipe and succeed. We’ll be doing a lot of that in the new category “A New Season.” Still, there are those days when you just don’t want the bother of reducing, prepping and cooking. There are alternatives. A visit to Whole Foods turned up a chilled bar featuring different takes on ceviche, a cold salad in which seafood is “cooked” in acid such as a vinegar or citrus juice. A ceviche of shrimp and scallops called my name and resulted in the creation of a cold salad supper just right for a triple digit temperature day. A small container of the ceviche – enough for topping two tostadas, a few large cooked shrimp for garnish, a mango for color and sweet balance to the ceviche, and an avocado for a third tostada featuring guacamole tostada completed shopping for dinner. Since the ceviche is sold by the pound, getting just enough for two tostadas didn’t require a bank loan for shopping at Whole Foods. There were enough other ingredients in the fridge at home to complete the meal. Shrimp and scallops ceviche, guacamole and mango – a cool treat to beat the heat. Garlic powder, to taste, or one small finely minced garlic clove mushed into a paste with a sprinkle of salt and the side of a chef’s knife. Tostadas, flat, crisp tortillas. These may be bought in a package, fried in a quantity usually too big for one or two servings. You can fry them at home or bake them in the oven for a “healthyish” version. I’m stealing this term from Bon Appètit because they have been publish lighter recipes in the magazine and online. Sprinkle your chips lightly with salt to taste. Preheat oven to 350°. Line a rimmed baking sheet with foil. Place three tortillas on sheet, and spritz lightly with cooking spray. If you want to make chips, cut a couple of tortillas into wedges and place on sheet with whole tortillas and spritz the, with cooking spray. Place in heated oven. Check after 10 minutes, turn tortillas and chips over and spritz again. After 10 minutes, check again and turn. Return to oven. Check every five minutes or so to make sure tortillas and chips are toasting crisp – no soft spots in middle or edges when done and not burned edges. Rotate the sheet pan in the oven to help with even cooking. Remove from oven and let cool. Guacamole, an avocado dip or spread that every cook swears that his/hers is best. I assure you, mine is the absolute best! This version is for a single guacamole tostada and slices of avocado for garnish. If you want to use the whole avocado and sue some for dip on your tortilla chips, go right ahead. Chop grape tomatoes into small pieces; slice scallion very thinly at an angle. Slice all the white and an inch or inch and a half of the gree. Mince and mash garlic clove into a paste. A pinch of salt helps to break up the garlic as you mash it. If you wish, you may use a light sprinkle of garlic powder (not garlic salt) instead of the garlic clove paste. One avocado, halved. Lay one half cut side down to prevent oxidation (turning brown). Spoon the flesh from the other have into a small bowl. Cut it up with the side of a fork, then mash it. I like to leave a little texture when I mash it with the fork. When I’m by myself, I squish it between my fingers and then get to lick my fingers clean – chef’s bonus! I don’t do that when making guacamole for guests – at least not where they can see me. Stir tomato, some of the scallion, garlic paste or powder and some of the juice of lime. The lime will delay oxidation, but you don’t want to overdo the lime juice when making this small quality of guacamole. Scoop flesh from remaining half of avocado, cut into six slices for garnish and sprinkle lightly with lime juice. Serving, spread guacamole on one crips tostada, garnish with slices of avocado and a couple of large shrimp. Place on plate. 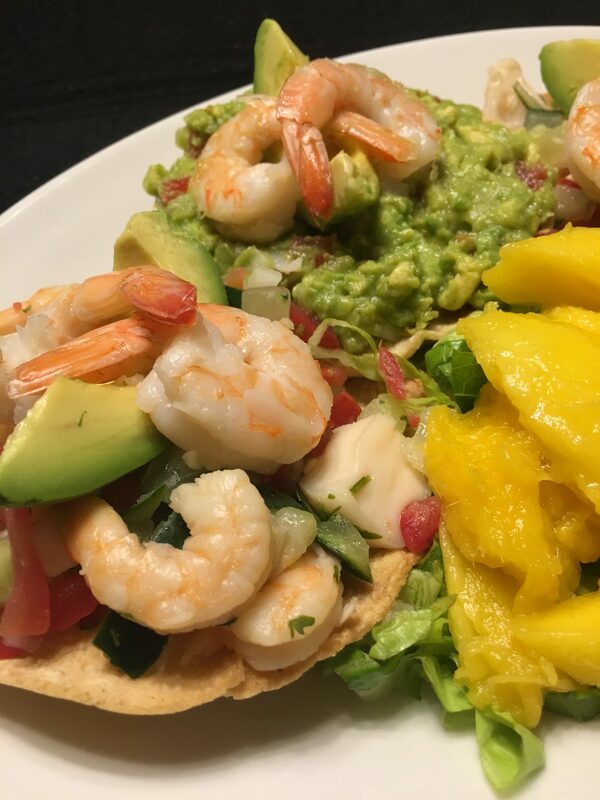 Spoon ceviche on tostadas, place on either side of guacamole tostada and garnish with large shrimp and avocado slices. Add lettuce leaf and mango carefully to the plate and enjoy your cool meal at the end of a hot day. My old e-mail, jimhastings@elp.rr.com, is no longer working. I had to close the Time Warner account that was in my partner’s name and also carried my e-mail. I opened a new account with Spectrum (they had purchased Time Warner) with the assurance that my e-mail would migrate to my new account. I have not had e-mail at that address since June 30. The Spectrum engineers are “working” on it, but do not reply to queries to a named person about my account status. I’m asking that if you have comments, you post them. I trust WordPress will send me notices at eprjh1@gmail.com. You are welcome to contact me at that e-mail address. Just an additional stress in serving as an estate executor; please be patient with me as I get posts going again. And feel sorry for the account people at Spectrum when I appear in the office Monday with my inch-thick file of what are you doing for me since I’ve opened my account? I will post a notice if I need help with posting bail. Remember the wedge salad from the late 50′ and early 70’s? A wedge of iceberg lettuce, that must have been a quarter of a head, drenched in creamy chunky bleu cheese dressing, and if you were lucky enough to be in the right restaurant, heavily sprinkled with crumbled crispy bacon. It still appears on the occasional menu. When it does, I look for beef carpaccio to be there, too. Creamy bleu cheese and delicately thin sliced raw lean beef! Forget the rest of the menu, these two appetizers become my meal, and no, you cannot have a taste! I am addicted to food magazines and websites. When I saw a new take on a wedge salad in one, I was up and off the the grocery store. Actually it turned out to be two stores were needed to find all the ingredients. My excitement was a grilled bok choi wedge salad. One small to medium bok choi, split in half and spritzed with olive oil, then grilled over low heat until the leaves wilt and get a little char and the stem is warmed through, but still retains it crunch. I topped the bok choi with halved yellow grape tomatoes, thinly sliced raw ripe shishito peppers and marinated Peruvian peppers. Then I drenched the salad with creamy bleu cheese dressing and lots of extra crumbles. The salad was served with a small sirloin steak, grilled to 145 and tented to rest for five minutes. It was a perfect medium rare. I wish I had sliced and photographed it, but I couldn’t wait do dig into the plate. My standard three baby potatoes halved and grilled provided a bit of starch for the meal. Because I am still working on my bag of shishito peppers, I grilled a few of the ripe ones. Their caramelized sweetness was a great foil for the slight saltiness of the bleu cheese! I cooked this on the grill last night after the temperature dropped to 100. Grilled bok choi wedge salad with “sides” of beef sirloin, baby potatoes and grilled ripe shishito peppers. It is fun to pare down a recipe, even when you know it might have been a little better at six or eight servings. Sometimes, it is great to whip up something from what you have on hand and enjoy the creativity. And, at other times it is good to visit something from the past and reimagine it. Being only slightly removed from generations of Texas and Arkansas farmers, I’m very fond of okra in many variations. Back in May of 2014, I started grilling okra on skewers. I like that it retains some texture and that it loses the sticky secretion of boiled okra and doesn’t make the mess of fried okra. I’ll love fried okra wherever I find it on a menu and am thrilled when I don’t have to clean up the mess of frying. Grilling red okra in 2014. Heat changes the red chemical color and it turn out green. Threading on two skewers makes it easier to turn. Elevating the skewers on clean bricks get’s it off the grate and helps it cook more evenly. 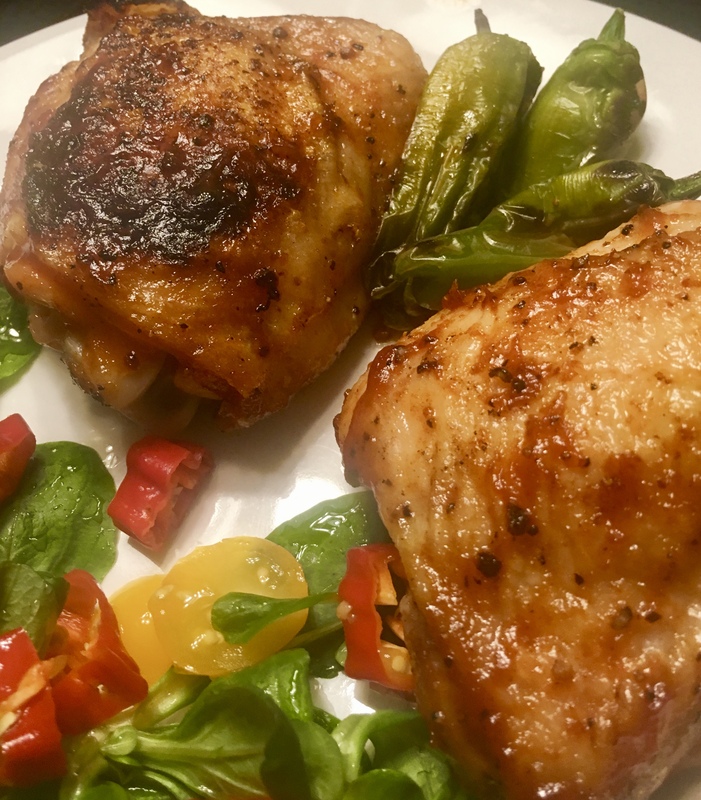 I found okra at the grocery store the other night and, since I was grilling chicken thighs, thought it would be a good side. I have a stainless steel thingy I put over my old grill grates and decided to try grilling okra on that instead of on skewers. It occurred to me I should grill some tomatoes and onion at the same time because I know that works! I cut the stem ends off the okra, sliced some onion and washed some grape tomatoes. If you feel you need a recipe here’s how I did it! I used a dozen pods of okra, two sliced of onion separated into ring and 10 grape tomatoes. I tossed it all with olive oil and a little salt and pepper. and put in on the grilling thingy over medium heat. I kept an eye on it, tossed be veggies as the cooked and tested the okra’s doneness with a fork. I wound up with a light char on tender vegetables. The tomatoes softened and wilted. When pierced with a fork, they yielded a hot delicious tomato juice to mix over the other vegetables. My chicken thighs cooked on another part of the grilling thingy at a higher temperature. 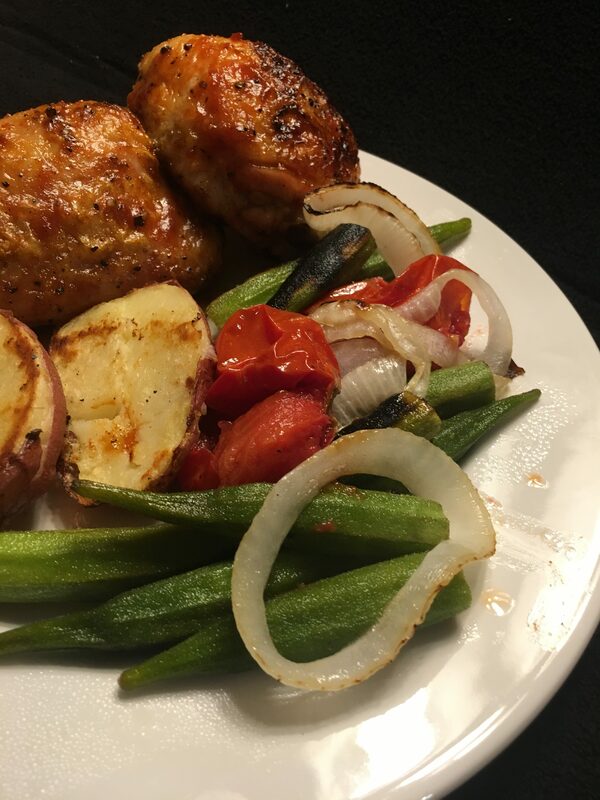 Grilled chicken thighs, okra, onion and tomatoes with grill-finished potatoes. The okra was tender but with a little texture and now sticky secretion. 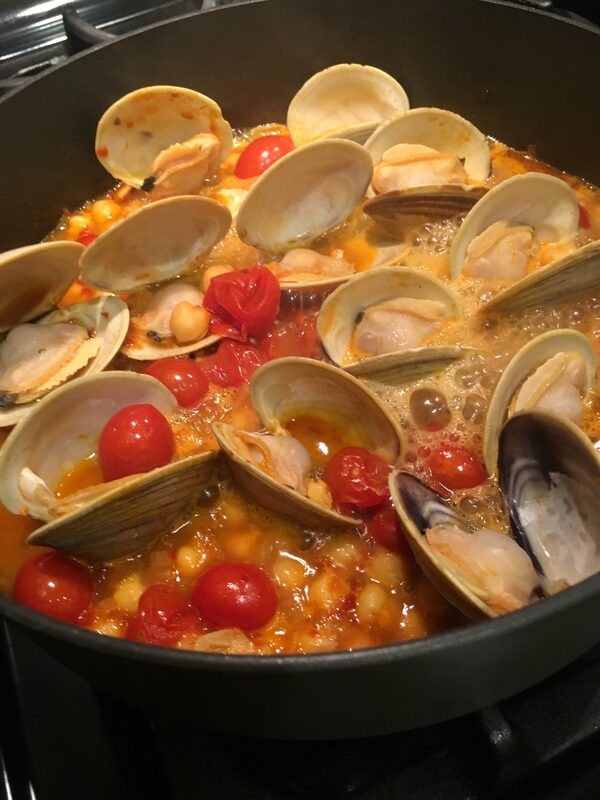 Delicious with the onion and tomatoes and reminiscent of boiled tomatoes and okra without the slick texture. The okra was so good, I decided to make it again the next evening. The store where I bought my first batch, was out. I went a sister store in the chain and found some. It looked a little long and I was concerned about it being stringy and tough. It was, but at least it photographed well. I was a very hot evening. Still over 100 at 6:30 p.m. Too hot to stand over a grill, so I decided to cook on a sheet pan in the oven. That gave me a chance to try making a roasted onion flower I had been wanting to try. Oven roasted onion flower, tomatoes and okra. Delicious and not sticky. Pan roasting the vetables at 425 until tender worked. I cut a thin slice off the stem end of a smallish onion, then carefully removed the roots. I sliced the onion almost to its base six times to make reasonably narrow petals. I drizzled the vegetables with olive oil before cooking and a couple of times while they cooked. The okra was done before the tomatoes and onion, so I removed it and set it aside until time to plate. I want to find small red onions next time I have guests and make little onion flowers to put on top of something. 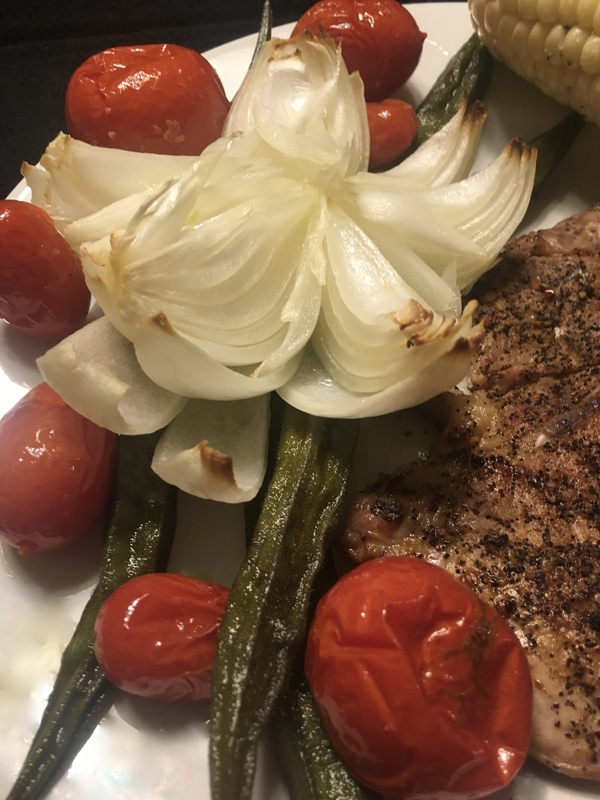 My white flower was tender and delicious with the okra and tomatoes and a pork chop. Left from the other night. Part of this New Season is cooking enough of a protein to have a second serving a couple of days later. I warmed the cooked pork chop for a few minutes while, the vegetables finished cooking. In the upper right corner, you see the tip of a roasted ear of corn. At eight ears for $1, I had to buy one for this meal. 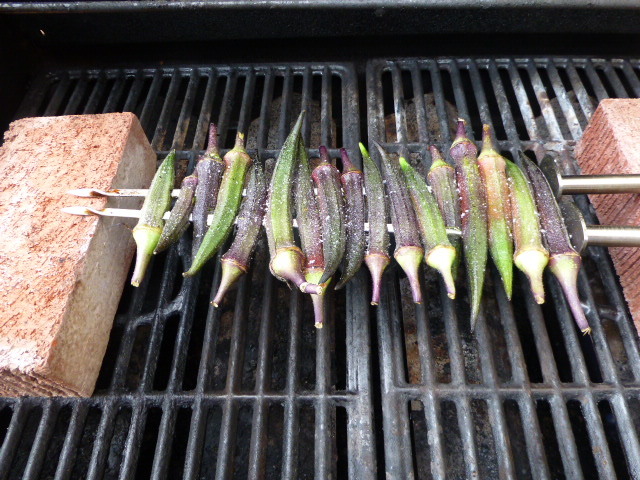 I will be doing more grilled okra this summer but only using smaller tender pods.